If you’re a mom of any children older than a toddler, chances are you spend a lot of time in the car! From preschool and school carpool lines to errands and after school activities there’s always somewhere to shuttle the family off to. 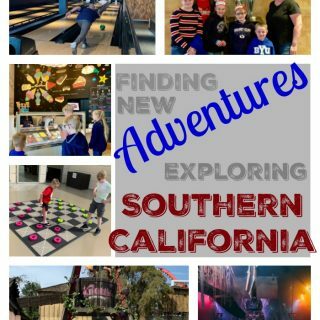 When you have lots of kids, that usually means your family trips become road trips to cut down on the expense, too. No matter why you’re in the car, these ingenious tricks will help all moms on-the-go to stay organized and sane while chauffeuring your kids from here to there. 1. Keep a trash in the car – A trash bag in the car can be incredibly helpful for keeping trash up off the floor and out of cup holders. In most cars, it’s easy to loop a plastic grocery sack or a reusable grocery bag between the two front passenger seat armrests. Slide the handle openings over each of the armrests and pull the grocery bag all the way to the back of the armrests so it’s out of the way and hanging within reach for most of the passengers. Get in the habit of having the kids collect their trash before they get out of the car to place it in the car trash bag or an outside can, if there’s one nearby. 2. 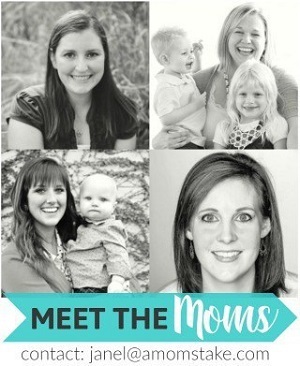 Books are a mom’s best friend – With all the kids in close proximity, it is easy for fighting to ensue. Reading is an incredible tactic for evading the drama and fights that could otherwise ensue. If you’re kids aren’t big readers, look for a quiet activity book to keep them busy and entertained so they don’t feel the need to pester their siblings. 3. Clip a decorated clip on your visor for each child – Keeping the car under control while you’re driving can be a challenge, and it’s important for you to stay focused on the road, rather than the backseat. Discipline tactics like timeout, groundings, loss of privilege, or other methods can be difficult to carry out and often don’t provide that immediate response to get your child’s attention. 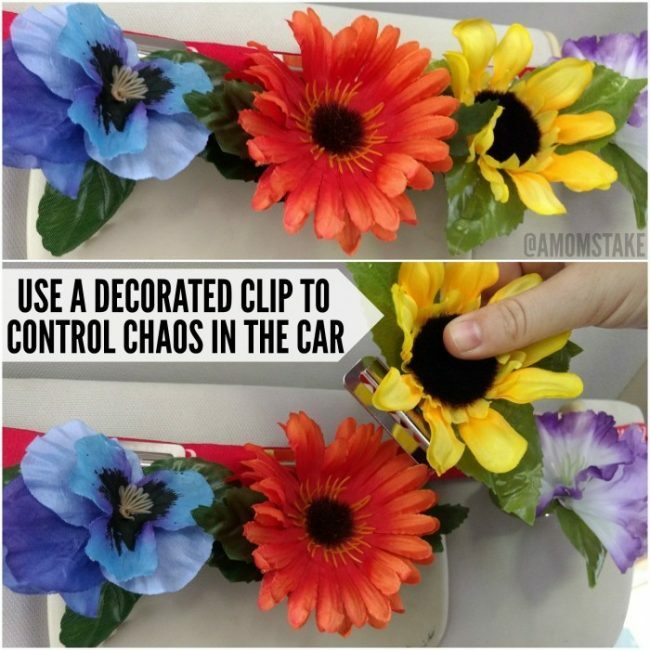 An easy in-car tactic is to decorate a simple clip to represent each of your children. Clip them to your visor or string an elastic ribbon around your visor and clip them to the ribbon if your visor is too thick. You can visibly move the clips as an indicator to your children of a warning. Or remove the clip completely if they’ve used up their warning. If you stick to the strategy, it will quickly become an effective tactic to keep the kids listening to your instructions. The blanket help when the weather turns cold and double as an impromptu sitting area for a play date at the park. I like to keep a few extra toys and books to swap out what my boys are using when they get bored while keeping minimal items in their personal space. Baby wipes can help with so many things like cleaning dirty hands and faces or wiping up a mess. Snacks, water, and a first aid kit are essentials in case an emergency arises or your car breaks down. 5. 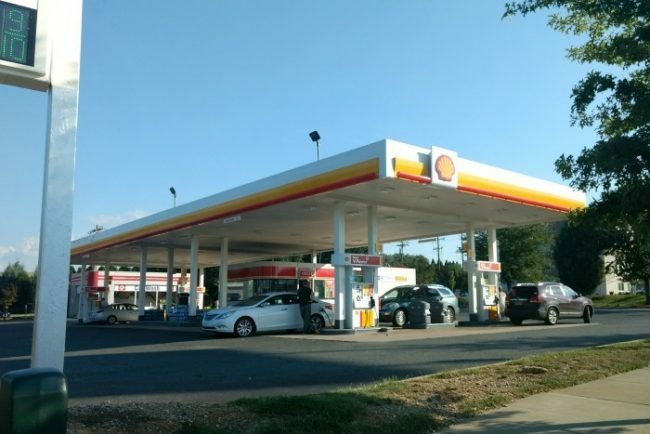 Don’t wait to fuel up – There’s one stop that squeezes its way onto your list at the worst possible time. I can’t tell you how many times I’ve climbed into the car already rushing and a few minutes late only to realize my gas light was on. When you’re always on-the-go, it’s important to fuel up at every opportunity you get. Avoid waiting until your tank is near empty because it is certain to be at the most inopportune time. 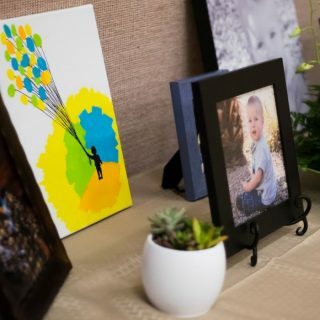 I stop whenever I’m nearby a station without a rush to get to the next appointment or scheduled event and while my toddler is happy or napping. It’s a great excuse to keep him napping just those few extra minutes, before our next stop. Fueling up while you’re already out on the town and avoiding those last-minute stops can also save you money. When you are in the car a lot, your fuel expenses quickly add up. Any savings you can find can make a big difference to your monthly budget. Shell and the Fuel Rewards program is bringing you savings that can really add up! 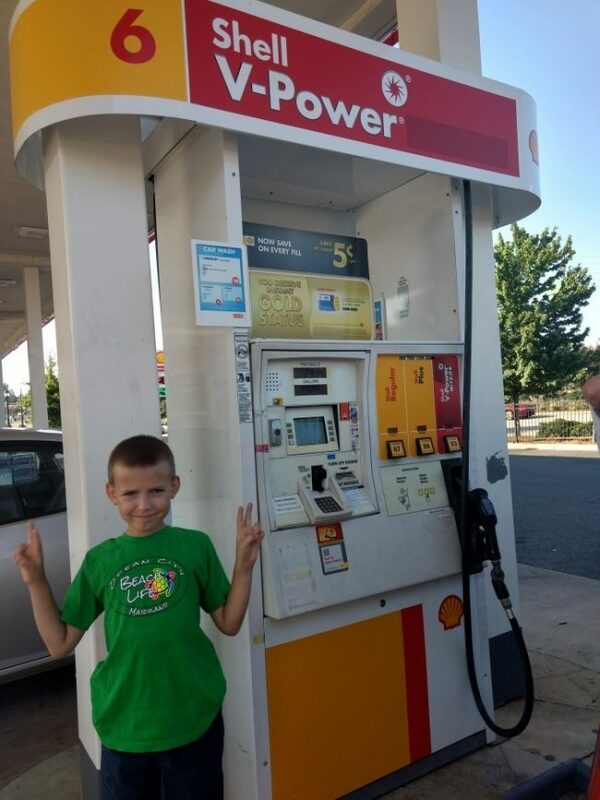 When you join the Fuel Rewards program, you’ll be able to save 5c/gal every time you fuel up (up to 20 gallons per visit) at participating Shell gas stations during their Instant Gold Status promotion. For a limited time, from the time you join through the end of 2017, you will automatically be upgraded to Gold Status and can easily keep your Gold Status savings after the year is over by making 6 or more qualifying purchases (of 5 gallons or more) during a 3-month window. Your Gold Status will renew for an additional 3-months for each benefit periods that you qualify. Save even more when you refer your friends to join the Fuel Rewards program. Just send your referral link to friends and family so they can also score Instant Gold Status with the Fuel Rewards program. 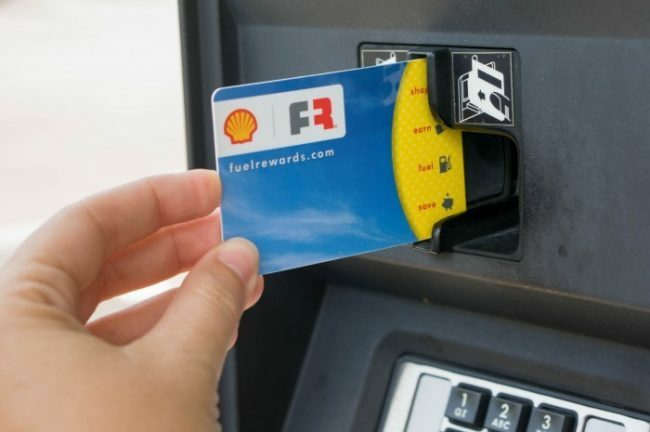 The first time your referral uses the program by earning a reward or using their card at a participating Shell station after registering using your referral link, you’ll instantly earn 25c/gal (up to 20 gal). Best of all, there is no limit to how many friend you can invite or how many times you can earn this additional savings at the pump! Head over today to join the Fuel Rewards program at Shell to start racking in the savings and #StayGolden. 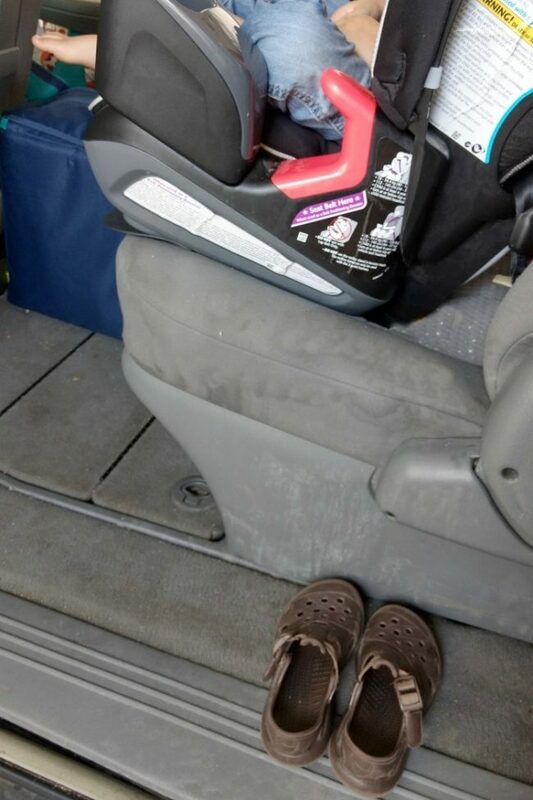 Take off kids’ shoes and put them by the car door. If you skip this step, they’re likely going to kick off their shoes anyways, and they’ll be buried in the back row impossible to reach. Have pre-portioned snacks ready to hand out in a moment’s notice, and within easy reach. Pack water and other drinks, and put them right behind the center console so they are really easy to grab. A small soft-sided cooler can help keep the drinks cold. Don’t over pack toys and activities. A few small toys they love will be better than a big assortment – that will turn into something to throw. 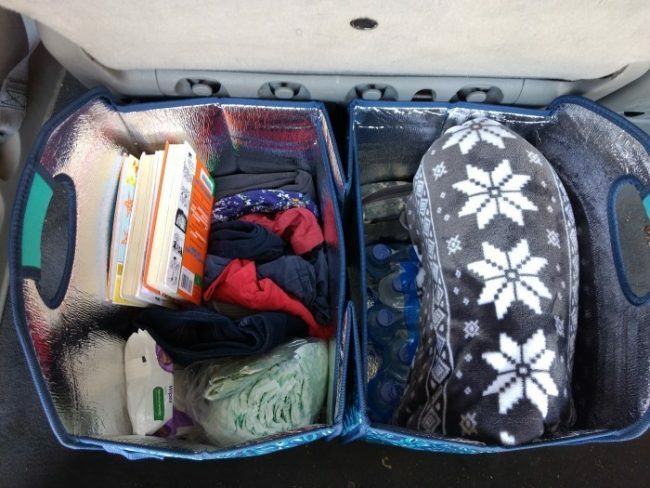 Pack extra changes of clothes, for the unexpected, for each child in one bag easy to access in the trunk. Let them fill one gallon zipper bag with whatever they want to bring for the trip. That could include colored pencils, paper and stickers, books, small toys, or a handheld electronic device. Limiting what they bring along and letting them help choose what they want will make clean-up easier. 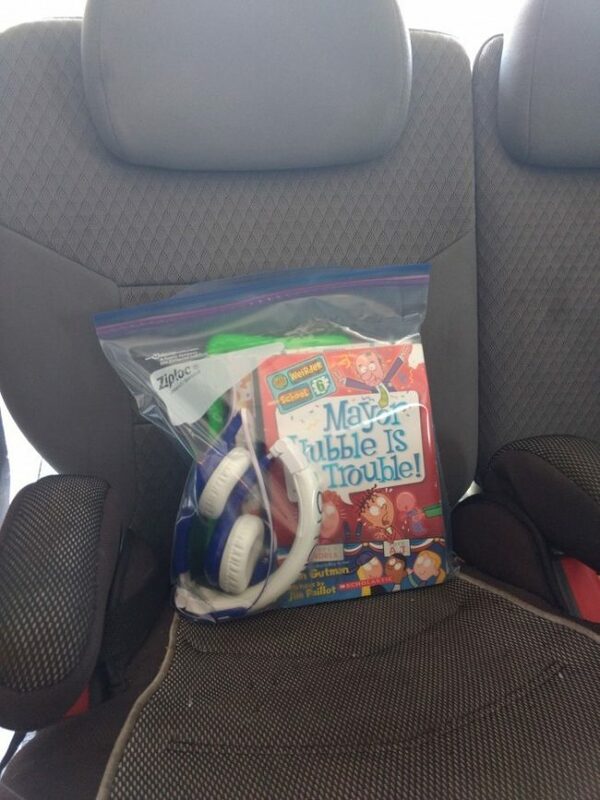 Warn your children if toys/books are out of their bag or specific spot in the car when you stop, it’s yours for the rest of the trip. Prepare a brown paper lunch sack with snacks, drinks, even a few small treats. They can choose when to eat their different goodies inside throughout the drive, but that’s all they get. This makes it super easy to ward off the “I’m hungry” chimes and lets them take some of the responsibility. The lunch sack will double as their trash container. Any empty wrappers go back in the lunch sack and into the trash once all their snacks are gone. Headphones can be a worthwhile investment for older kids. Let them connect to their gaming system, music player, smartphone or device and keep the car quiet and calm without all the conflicting noises. What are your tricks and tips for on-the-go? These are all awesome! It’s really great to be ready for anything! I hate having to deal with all the crap in the car with kids. No matter how clean I try to make it, the car is always a mess when you have kids! I try to stay organized with these tips, but they’ve found a way to make it a mess! Great tips! We are always in the car with the kids, so I will take all the tips I can get. I love that you have everything so organized. I am SO thankful my 2 are still in car seats. It will be nuts someday… but for now, I’ve got my peace! Yes I love these ideas! We are now in the car all the time with my kiddies new commute! I wish I had used something like the decorated clip on the visor when my kids were younger. I think this is a brilliant idea! I love all these ideas. I need more organization in my car. Nobody is allowed to eat in one of our cars, so we keep it pretty clean. Things are so different now days then when my kids were little. My kids simply read books in the car or played car games. Now we need to entertain our grandkids. Ha! Great tips that I’m sure to work on with my grands! I’m definitely guilty of waiting until the last minute to fill up! Not a good idea! I like your car tricks! The flower clip is a brilliant idea! It can be so dangerous dealing with kids while driving. This is a great way to have a quick reprimand without moving your attention too much off the road. These are all great car tips. I have a bag with a change of clothes for everyone in my family. I need to get some flower clips for my car. I need all the help I can get with gas lately. We live pretty far away from places we travel to regularly so we are using much more gas! So many good suggestions. Usually we just have a bunch of books and travel games but you have way more ideas that I need to try. I am so unprepared, all the time. I really need to go through your post and check off what I need to do! Holy moly. You are the most organized person I’ve ever seen. Your car has just about the most put together travel system I’ve ever seen. 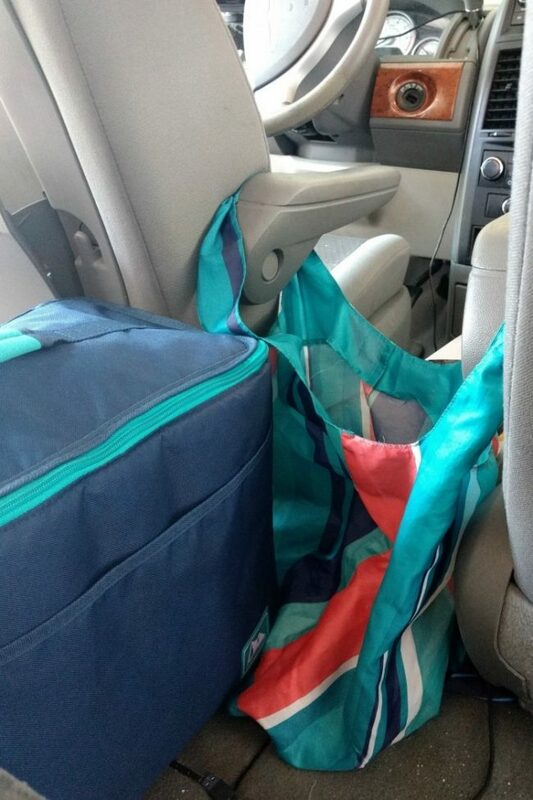 Being organized in the car would have been a lifesaver when my son was younger! I was happy just to remember a trash bag let alone all these other great tips. I like the clips idea to give warnings. It’s so hard to discipline when you are on the go! Wow! Talk about being ready for anything! That’s awesome! 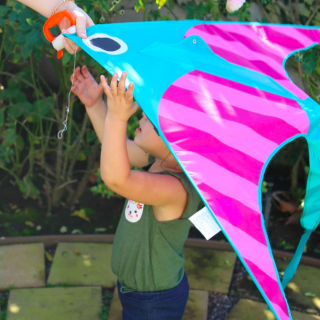 These are great tips and I love that you highlighted ideas for little and older kids. You are way more organized than I am! WOW! 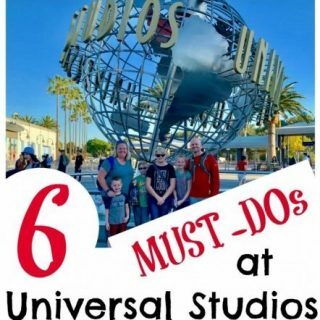 I need to make sure I do almost all of these on my next road trip! I learned the hard way to keep a trash bag in the car. Now I always have one in there. Awesome tips.